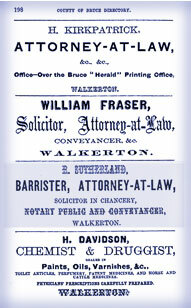 Image: County of Bruce Directory, listing Sutherland's practice. Robert Sutherland was born in Jamaica and came to Kingston, Ontario, to study at Queen's University in 1849. While at Queen's he won 14 academic prizes. In 1852, he graduated with honors in classics and mathematics. He then pursued law and was qualified by 1855. He served as a lawyer in Berlin (now Kitchener) and Walkerton (near Owen Sound) and held a municipal office. Upon his death, Sutherland, who had never married, left his estate of $12,000 to Queen's University. This bestowment allowed Queen's to remain separate from the University of Toronto. Sutherland may have been the first Black student and the first Black graduate of Queen's and the first Black lawyer; he was also clearly one of the most important benefactors of Queen's University. A news story about the renaming of the Policy Studies building to Robert Sutherland Hall in honour of Robert Sutherland, who graduated from Queen’s University in 1852. From the queensjournal.ca website. A news story about Robert Sutherland, the first Black man to graduate from Queen’s University and the first one to graduate in North America. From the queensjournal.ca website. A profile of Queen's alumnus Robert Sutherland. Also includes digitized archival material that relates to Sutherland’s legal career. From the Queen’s University website.